Additional parking along the street, next door at St. Paul Lutheran Church in the gravel lot only and the defunct grocery building south of the church. Click here for a printable .pdf map of free downtown parking. The mega event and regional team/individual contests are Saturday only, but there are many activities and events for your enjoyment, morning to night, Thursday, March 8 through Monday, March 12. Are you a geo art lover? There are more than 600 geocaches in or near Denton, organized into 6 different art installments. Just search this website and map. How about lab caches? This year's adventure, Let's Go Dentoning! gives you ten interesting and entertaining labs. 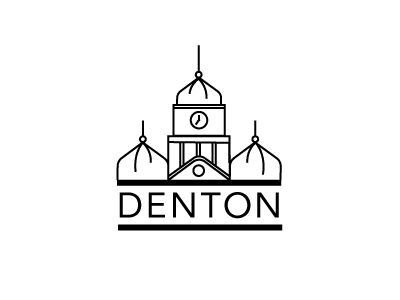 The journey allows you to explore the locations making Denton a unique North Texas city. The labs are available to play until Monday, March 12 at noon. Geo art and Let's Go Dentoning! labs available all day. Step back in time at the sweetest spot in Denton's downtown square, a U.S. designated Historic District. Beth Marie's Old-Fashioned Ice Cream & Soda Fountain serves over 100 flavors of cold creamy goodness. The fabulous flavors include Cupcake, Sinful Oats, Raspberry Truffle, Jameson, Red Wine and Bleu, Hansel and Gretel, Purple Cow, French Toast, Salty Dog, Sweet Sunflower, Jack and Coke, Honey & Lavender, Courthouse Pecan, Elvis, Shiner Bock, Wobbly Monkey, Guinness and Dr Pepper-flavored Texas Doctor. Get your coffee, smoothie, tea or double chocolate triple decaf skim almond milk spiced chai latte in an 100% recycled paper cup, or some such, and a pastry at Denton's hippest java joint. Enjoy a BBQ sandwich dinner and the jazz stylings of big band Foo McBubba - a perfect night at the meet and greet event on the eve of the 16th Annual TXGA Texas Challenge & Festival. Pick up registration packets and SWAG, discover trackables, peruse the vendor tables and enjoy the company of other geocachers. 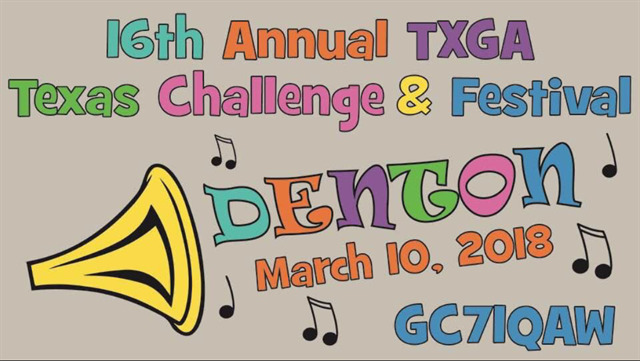 The TXGA Texas Challenge & Festival hosts an exciting contest pitting geocachers from six Texas regions in a friendly competition to see which region can accumulate the most points in a 4-hour time crunch. The winning regional team is awarded the coveted Golden Ammo Can. The individual competition is a personal challenge to see how players stack up against their peers. The location is disclosed at the event. Come out and congratulate the 18 people who completed the Texas County Challenge in 2017. This event is at The Downtowner Event Center. All attending geocachers may log an attended log and sign the event log book. However, finishers attending the event may sign the large Texas-shaped board as they have in years past. Have dinner with your friends and other geocachers at Denton's Austin Street Truck Stop and enjoy a veritable cornucopia of cuisine choices such as noodle bowls, BBQ, bánh mì, Korean sandwiches, gourmet pizza, tacos and kimchi. Welcome to the garden of gourmet doughnuts! On Friday and Saturday nights, Denton's hippest doughnut venture serves specialty fry bread gold from the back of the city's finest steakhouse between 11:00 PM - 1:00 AM. These aren't your father's fritters! This late-night doughnut hole in the wall prepares sweet and savory options, such as Love burger, strawberry cheesecake, meatloaf, blood orange custard, Texas chili, salted caramel, Nutella cream, chips & queso, chocolate mousse, buffalo chicken, cookies and cream, key lime pie, raspberry chocolate, blueberry jam and BBQ pulled pork. Breakfast is the most important meal for Texas Challenge winners! Meet up for breakfast before the CITO and awards ceremony. Join us for the presentation of awards and ammo cans and to help clean up historic Quakertown Park, a Texas Historical Commission designated landmark. There is ample parking on all sides of the park. Waymarking is a geocaching sister site of Groundspeak. Waymarks are like virtual geocaches. There are hundreds of waymarks within one mile of this location. Many geocachers are also waymarkers. Join us for an evening of pizza and conversation. Challenge is Over! Challenge is Over! Still in town? Join D.A.W.G.S. (Denton Area Wayward Geocache Seekers), the local geocaching club, for laughs and tacos. The club meets at Fuzzy's Taco Shop every Monday night as it has for over five years.